In denim, garment washing is done to produce effects like color fading with or without patchiness, crinkles, seam puckering, hairiness, de-pilling, softened-hand feel, stabilized dimensions etc. Normally the process of garment washing involves stages like product evaluation and preparation desizing, braiding, bleaching, anti-chlorine / post scouring, over-dyeing (optional), softening, hydro-extracting and tumble drying. Various process effects for special products can be obtained by using combinations of these procedures. Different processing parameters can be set for each stage to enhance and improve the effects. Since denim constitutes the largest portion of the garments that are washed, the term 'wash' has come to mean the finishing of denim garments. This method is most common and is used to give denim an 'old look'. Pumice stone is one of the most important components used to abrade the surface of the fabric to obtain a surface pattern effect with color contrast and soft - handle. In this process, the fibres on the surface of the fabric are broken and removed and the inner white fibres of the warp yarn are gradually exposed. Natural patterns can be formed as the degree of abrasions varies in various parts of the garment. 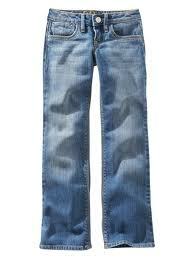 This is a bio-catalytic method wherein an ultra-soft handle effect can be produced on denim. The hydrolytic effect of enzymes causes the loss of surface fibre, which improves surface smoothness and softness of the fabric. This process is usually done without stones by using an oxidative bleaching agent like hypochlorite. Sodium hypochlorite is normally used as it is cheap, convenient and quick. Other agents used are sodium percarbonate and sodium perborate. A bio-bleaching technique known as "DeniBleach Technology" has recently been introduced by Novo Nordisk. This is achieved by dry tumbling with pumice stones soaked with bleaching agents to produce a 'snow' pattern effect on denim. Stones are used to deposit a chemical on garments to strip off the colour. This chemical deposit removes colour only from the outer surface of the garments and produces a frosted appearance. Indigo and selected sulphur dyes are the most popular candidates for this procedure. This process is used to obtain localized abrasion effect. Usually, aluminum oxide granules are blasted onto the garment surface at a very high speed. The abrasion force rubs off the indigo-dyed fibres. 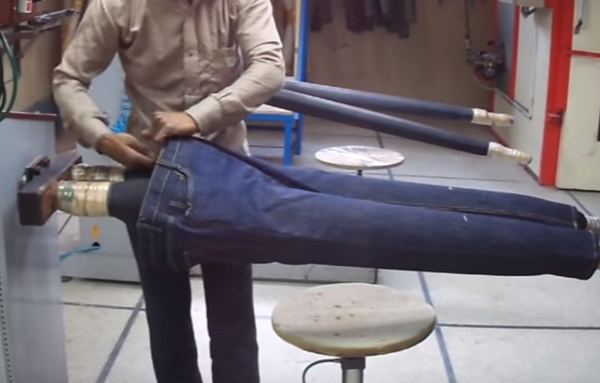 This article covered different types of denim washing with explanation.